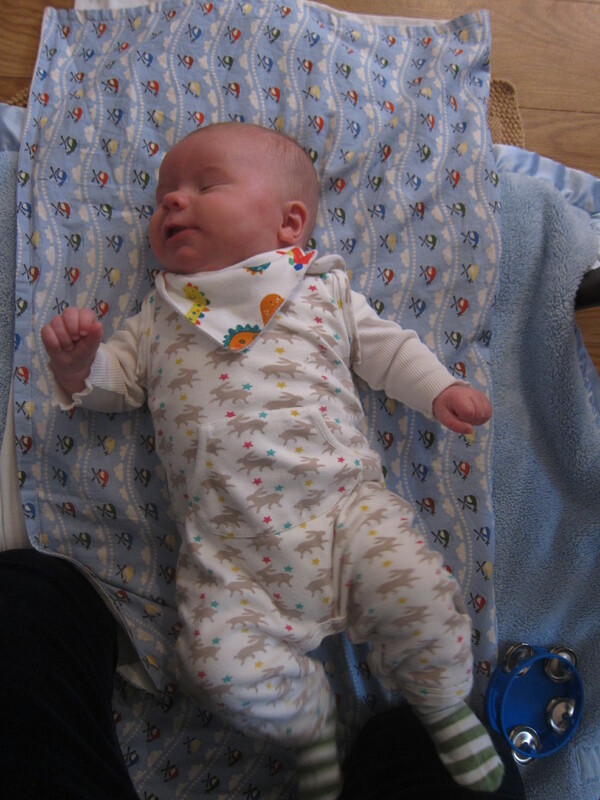 Last week I took the little fella back home to meet his Norn Iron half of the family. It was fantastic having a multitude of willing arms to cuddle him and rock him to sleep, so I took full advantage of the spare time to practice embroidery. On a hoop! I must say I felt all Elizabeth Bennet stitching away. I’ve been using Sublime Stitching as my go-to guide. It is brilliantly written – very simple and concise. 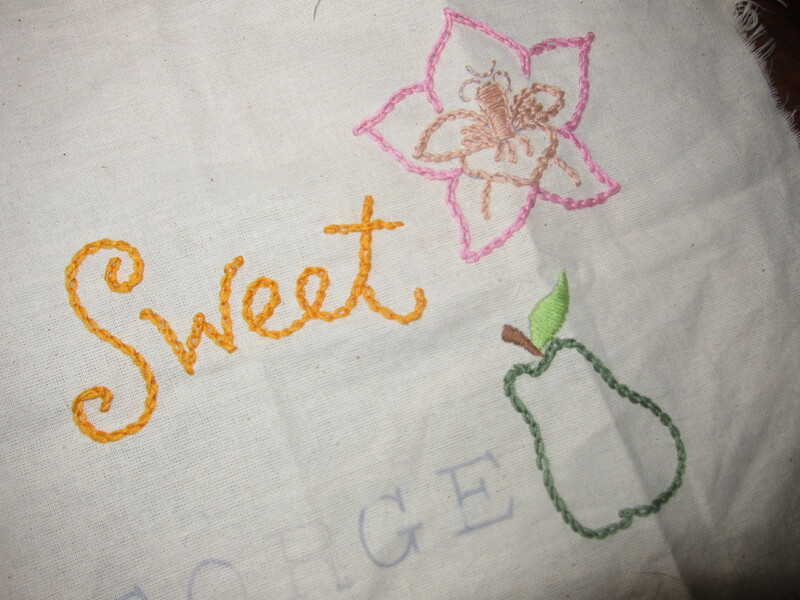 I’d recommend it for anyone wanting to try their hand at embroidery. It also comes choc full of wonderful transfers, just waiting to be ironed onto your chosen fabric. Although the book offers a multitude of stitches to choose from – two will pretty much accomplish anything you want to try your hand at – the chain stitch and the satin stitch. 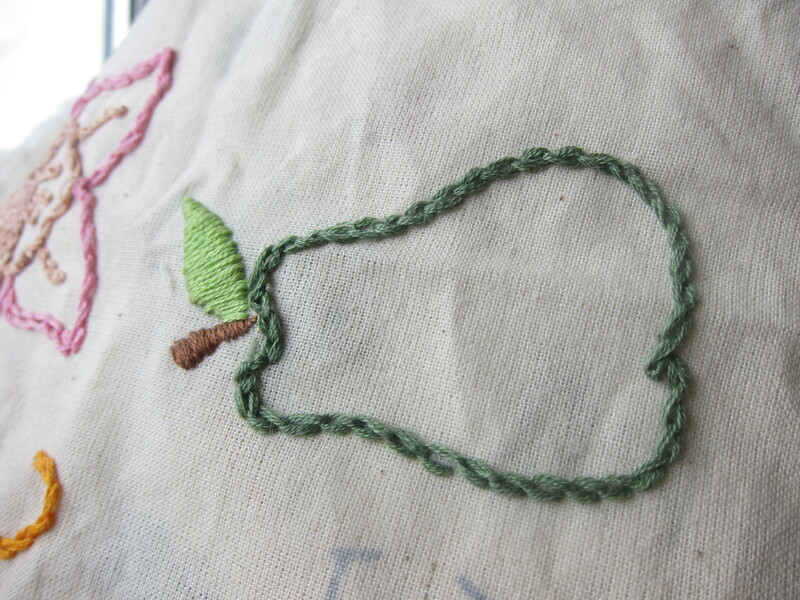 You can see the chain stitches outlining the pear above, whilst the satin stitches fill in the stem and the leaf. I love the raised effect – it adds a whole new dimension to your make. I was just practicing so I stitched onto calico (a chopped up Colette Violet muslin in fact – check me out with the recycling) but I’ll be transferring my final chosen designs onto a lovely white cotton and then working them into a log cabin quilt for George. 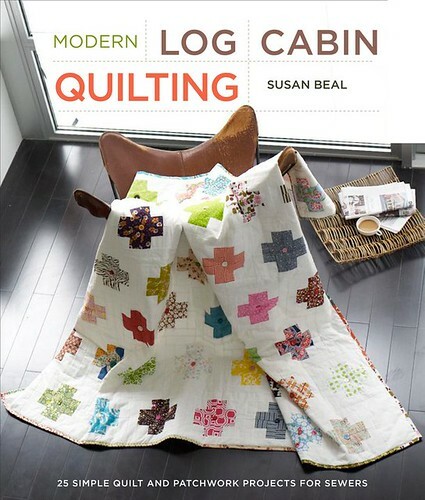 I was hoping to use the design on the front of Modern Log Cabin Quilting by Susan Beal but I’m wondering now where my little embroidered pictures might actually live on this lovely design without detracting from it. I’ll have a think about it. 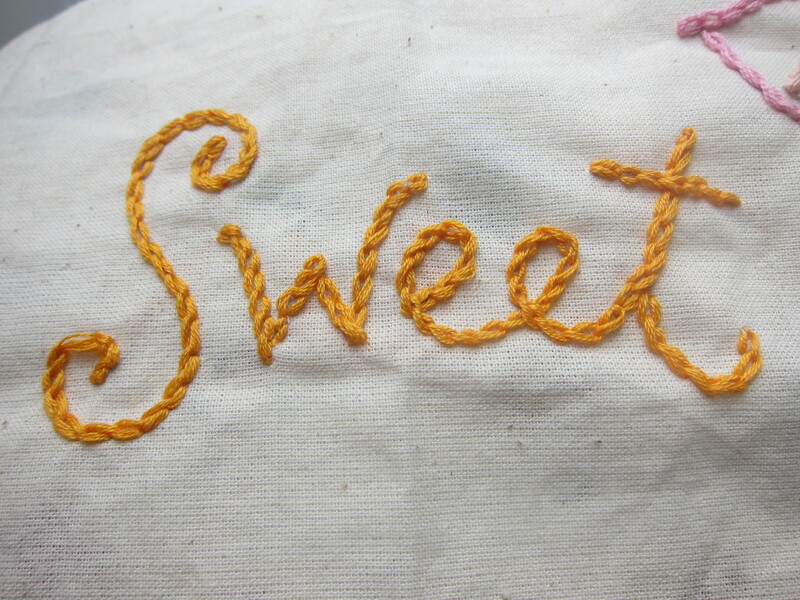 Embroidery is a great craft to try if you’ve got a few minutes spare and it’s extremely cheap to get started. Hoops cost from as little as a couple of quid and embroidery flosses aren’t much more. Then as long as you have a needle you can get going. I used a size 20 tapestry needle and a 7″ hoop. But at this rate it may be New Year’s Eve before it’s complete! How are you getting on with your Sewlutions? Oh and here’s a little pic of himself, just so you can see what a little pudding he’s become! I’ve been feeding him myself and I’m just delighted to watch him grow… and grow… and grow! Boo to you too Google. Yes! I’ve been invited by the amazing Portia of Miss P to take part in this year’s Refashioners! I am so excited by the line up this year. I mean – check. this. out. PEOPLE. Christ on an Easter bike – how did I get to join this illustrious lot? Especially since the closest I’ve got to my sewing machine this year is a couple of longing looks. But this is the perfect project to stretch those old sewing muscles non? Last year Portia rounded up a bunch of stitching geniuseseseses and cajoled them into creating astonishingly gorgeous garments from, let’s face it, some questionable items. Check them out here. Newsflash – this week I have the most amazing Handmade Style participant. You will not be disappointed. I repeat: YOU WILL NOT BE DISAPPOINTED. Watch this space. P.S. Congratulations to Tilly of Tilly and the Buttons who will be appearing in the sewing spectacular that is The Great British Sewing Bee. Every time I think of it I squeal with excitement. Have you ever seen someone you know on TV and gone all squeaky with delight? That’ll be me come April 2nd at 8pm. I believe the hash tag on Twitter is #GBSB. If I can unglue my eyes from the telly I’ll be checking out all those tweets too. From vintage chic to clean modern shapes, how do these seamstresses create and communicate their own unique style in their projects? What and who inspires them, from film and music to everyday life. And what’s their dream outfit? Rachel, I love how on trend many of your makes are and how you’ve always got one eye on the world of fashion. How would you sum up your handmade style? Thanks, Joanne. I try to wear what suits me but I am not afraid to try new things. Ever since I was young, I have always enjoyed playing with fashion and get inspired by design ideas. I would say my style is elegant with a twist. I love tailored and classic pieces with a unique feature or modern design that stands out. I am a lot about comfort too so if I feel uncomfortable I won’t wear it, even if it’s cute. Where do you find your style inspiration and how do you channel that into your me-made wardrobe? At the beginning most of my inspiration was my own closet by trying to recreate items I loved or just the pure fun of figuring out how they were made. I love watching fashion week and Style.com but with time my handmade style is being hugely influenced by other bloggers and by what was lacking in my wardrobe. I learned to appreciate different designs and great techniques even if they don’t suit me. I even included vintage inspiration on my modern clothes. I channel my inspirations in two categories: Silhouette and colour palette. I love the 50’s silhouette, so all my projects try to highlight my waist and my Brazilian background influences drives my choices for rich colours and print. This doesn’t mean I don’t sew practical garments, like my black skinny pants I sewed last year. 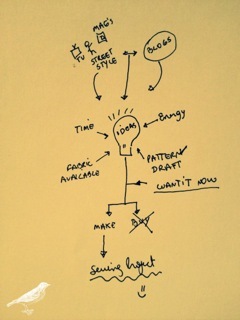 What’s your creative process in deciding what to make? Is it a fabric-based decision or a pattern that inspires you? There are three fabric types I cannot have enough of : Cotton sateen, linen and wool. All my favourite items are made out of those. I really enjoy the flat pattern stage of design where I change areas I don’t like in patterns or draft a pattern. I take a while before I cut things in fabric. Sometimes I work hours on some things and they never get cut in fabric because another idea and pattern looked more interesting to make and I embark on another adventure. Sometimes I wonder how I can actually finish things. Who are your style icons and why? My mom has always dressed well, inspiring me and she has instilled in me that style is actually about confidence and feeling good about yourself. Sewing is a great buster of accepting your shape and highlighting your potential. Are there any particular designers or high street stores that you use for inspiration? My ultimate and hands down favourite is Brazilian designer Alexandre Herchcovitch. He was the ONE that made me rediscover fashion – the first time was actually when my 7 yr self used to sew clothes for my barbie and they were suppose to be “crazy”– Now I know what they were, Avant-garde. He was my first designer purchase and I was 16. I treasured so much his creations because I saw something in myself that came out wearing his clothes. Some kind of inner confidence. Something that I thought that no one else would understand in me but he and I knew in my heart those clothes were meant for me. Sewing my own clothes brings me the same amazing feeling. Another designer that intrigues me is Belgian fashion designer, Martin Margiela. He worked at Jean Paul Gaultier before launching his own label in 1988. I tried my hand at Martin Margiela by making a jumper out of socks. Anyone that saw his latest collection for H&M could buy it for $100 (£65). My serger and a few pairs of socks I had around and voila, I made two sock jumpers. I had been meaning to get a tutorial on this project for ages. It is very simple and offers effective variations depending on the size of the socks used. If you had to select one self-stitched garment that really encapsulates your style – what would it be and why? My Sherlock Holmes Cape nicknamed: Sherlock’s horse. The pattern is V8674. Version C. It has a classic shape and I can wear it forever, and the funky lining cheers me up. It uses beautiful quality fabric and I learned the most with this project. It really changed my sewing horizon. Why do you sew what you sew? Do you choose projects on a whim or do you look at your existing wardrobe and spot vital gaps to fill? Both, I think it’s a way for me to recreate ideas I have and manage with my current skills. I cannot keep up with them so I try to sew what I can, always trying to push my knowledge forward and hopefully some day I will be able to actually sew what I have exactly in my mind. I love dresses and they are essential for my lifestyle. You don’t have to think what to pair them in the morning, they are comfortable and they look elegant and put together effortlessly. Do you ever take risks and experiment with your look? What’s worked and what hasn’t? I take a lot of risks by not following instructions and many projects end up not looking as intended. I don’t feel fazed by that as it helps me understand constructions restraints and that mistake may turn into a fun design feature. My biggest problem is that I overfit garments. I need to learn accept the right ease. For example, my peony. The style doesn’t suit me and by tying to get a closer fit, end up making uncomfortable to wear. In the end I had to open the seams and give myself more room. There are certain looks some of us just can’t pull off… do you have a style bugbear? Yes, and makes me so jealous lol. I cannot wear fussy or baggy clothes. Specially those boxy Japanese designs. Makes me look awful. My body needs structured garments. It’s a shame because I would love to be able to rock those clothes. What would be your dream outfit, existing or otherwise? That’s so hard to pinpoint because it changes very often. It’s a work in progress in my mind. I need personality, something that stands out without being in your face/out there. What other sewing bloggers would you recommend for great individual style? Kazz the spazz: She brings the modern elements of design I like and she explode them. Her outfits are always intense and creative. She has a great fashion sense. Lladybird Lauren: Can sew a storm with a high productivity that’s hard to beat. What can I say, dude! You are just too cool for school. Erica B is the trendiest sewing blogger I know. she rocks! Finally, what’s on your sewing table right now? A coat. Yes, I will jump in the deep end. Its time to conquer some fears and start the new year with a project I been putting off for ages. (Ed’s note – that’s how behind I am on these interviews guys – sorry!) Catherine of Cyberdaze‘s coat journey really inspired me to go for it and of course the immense support of the sewing community. I’m privileged to have met so many amazing and talented people. And we’re privileged to learn more about your unique style Rachel. Thanks for taking part! Um it’s another Coco… but it’s got polka dots on it!